It’s not a mandatory thing, but it is kind of fun to be online and talk trade with 20+ General Managers of the Mid-West Baseball League. We will be using our SLACK CHAT – CHAT ROOM for the General Managers Meetings & Draft Day 2019. We always appreciate it when we get a lot of Community activity from the General Managers, much of the off-season wheeling & dealing is usually done at this time. It’s a precursor to Draft Day to make sure everyone can get into the SLACK CHAT – CHAT ROOM. The Commissioner Office will arrive in the SLACK CHAT – CHAT ROOM around 8:45 PM ET on the dates listed below, and General Managers can come and go as they please. The Meetings usually last about one hour maybe two. 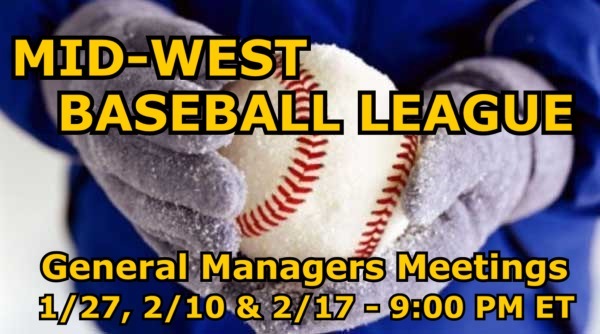 2019 MWBL DRAFT DAY is Scheduled for Saturday February 23rd, 2019 – 10:30 AM ET.